Imagine having the earth at your fingertips. With Google Earth, it has come true for millions of people who have access to computers and broadband Internet connections. They can, with the flick of their mouse and a tap on their keyboard, zoom into any corner of the earth and see it-literally. Scientists have set a new record in sending information through thin air using the revolutionary technology of quantum teleportation – although Mr Spock may have to wait a little longer for a Scotty to beam him up with it. plasma states of matter. In which of these can we include fire? Consider this. We take a solid and start heating. This increases the vibration of the molecules of the solid. At some point their vibration energy overcomes the bonds of the lattice and the solid turns into a liquid. Molecules in the liquid are not completely free; they are still subject to intermolecular forces. Google Earth combines satellite imagery, aerial photography and data from maps to make a 3D interactive template, or a virtual globe. As with some other Google applications, Google Earth was not the pioneer. Actually, Google was a latecomer; it bought a company called Keyhole Inc, which had created a programme called Earth Viewer, tweaked it and re-named it Google Earth, which delivers a great experience to computer users, who came to sample the latest in global voyeurism. Indeed, it has turned some computer users into Peeping Toms. The resolution of images that you get from Google Earth’s new “Street View”, service, that provides users a street-level picture of downtown areas of various U.S. cities, is so good that you can even read number plates and identify people! This is clearly a case of too much of a good thing. Google has long been facing charges about providing information that impacts the security of nations, and, indeed, international security, since it provides information that can be used by terrorists. A month or so ago, police in the US foiled a plan by a terrorist cell to blow up fuel tanks and a jet fuel pipeline at New York’s John F. Kennedy International Airport. Evidently, Google-produced images that clearly showed the airport’s infrastructure were used for planning. President A.P.J. Abdul Kalam had expressed concern over the availability of high-resolution pictures of sensitive locations in India, as had the Indian Space Research Organisation, when it became clear that vital installations, including IAF airports and sensitive buildings like nuclear plants, were clearly showing on Google Earth. Security agencies had demanded that Google remove the images, or at least blur them. Google did agree to the request. 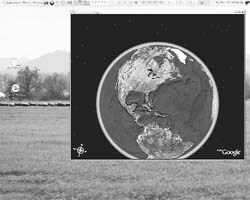 What is the resolution of images that Google Earth provides? Well, it is about 15 m per pixel for most land areas. It could be double that for some densely populated areas, and lower for oceans. Only some cities in the US and in Europe are mapped with a very high resolution. How does Google Earth operate? It maps the earth by the superimposing images obtained from satellite imagery, aerial photography and GIS 3D globe. It actually uses much of the commercially or freely available images from various government agencies, particularly NASA’s globe software World Wind using Blue Marble, Landsat or USGS layer, each of which is a terrain layer in the public domain. Google Earth is one of the many players in this game and other include such Internet giants as Yahoo, with its Yahoo Maps; Amazon.com Inc.’s A9.com already has showed street-level views of two dozen major American cities through its BlockView mapping service, and Microsoft Live Search Maps service that plans to expand to include more cities worldwide. “Eye in the sky” has been an uncomfortable reality for over five decades now, but it was largely in the domain of security agencies, which operated under government-determined norms. Now that the images and maps of the globe are freely available, companies that provide these services will have to show restraint to ensure that sensitive information does not become freely available for misuse by terrorists. A team of physicists has teleported data over a distance of 89 miles from the Canary Island of La Palma to the neighbouring island of Tenerife, which is ten times further than the previous attempt at teleportation through free space. The scientists did it by exploiting the “spooky” and virtually unfathomable field of quantum entanglement – when the state of matter rather than matter itself is sent from one place to another. Tiny packets or particles of light called photons were used to teleport information between telescopes on the two islands. The photons did it by quantum entanglement and scientists hope that it will form the basis of a new way of sending encrypted data. The teleporters used in the TV series Star Trek are said to have been based on the idea of quantum entanglement and the latest study demonstrates that elements of the phenomenon could have a practical use in the real world. However, quantum entanglement has so far been carried out only on the simplest forms of matter and scientists believe that a fundamentally new approach will be needed if it can ever be used for teleporting people or even non-living objects. Robert Ursin of the University of Vienna said that the latest experiment in quantum entanglement demonstrates its potential as a means of communicating sensitive information via satellites using quantum cryptography, which would effectively deploy an uncrackable security code. “We really wanted to show that this can be done in the real world and our dream is to go into space and try it there. This was a feasibility study funded by the European Space Agency,” Dr Ursin said. “In principle such experiments may in future be used for teleporting information between places, but our system is not capable of transporting matter,” he said. Albert Einstein famously described quantum entanglement as “spooky action at a distance” and it relies on the fact that two photons can be created in such a way that they behave as a single object, even if they are separated by large distances. In behaving in this way they are acting as a teleportation machine because any changes to one causes similar changes to the other. The way this is done is via a third photon, which is teleported from the photon in the transmitting station to the photon in the receiving station. In the process, the third photon becomes entangled with the transmitting photon and so carries its quantum information to the receiving photon, which interacts with the third photon in such a way that it becomes identical to it - hence the information is successfully transmitted. “We know that quantum entanglement works over very short distances. But we’ve shown it can be brought out of the laboratory and be used to transmit over long distances,” Dr Ursin said. Consider this. We take a solid and start heating. This increases the vibration of the molecules of the solid. At some point their vibration energy overcomes the bonds of the lattice and the solid turns into a liquid. Molecules in the liquid are not completely free; they are still subject tointermolecular forces. We go on heating to the point where the thermal energy of the molecules allows them to escape the shackles of their neighbours. Then we have a gas. If we go on heating this gas we may come to a point where the energy of collision of the molecules is high enough to break up the atoms. In other words electrons can be knocked out of the atoms. This is a state where the overall charge of the gas is still zero but the gas is made up of positive and negative particles. Such a gas becomes a highly conducting medium. It would be all right to call this state as a plasma state. In this state electricity is easily conducted. Movement of charged particles produces magnetic fields. Coupling between currents and magnetic fields is central. If the plasma is propelled in a certain direction the entangled magnetic fields travel along with it. This is the phenomenon that is encountered when streams of solar plasma travel out during solar activity. When this plasma, along with its frozen magnetic fields hits the magnetosphere of the earth we experience problems in radio communication and magnetic storms. A familiar example of plasma is encountered in the fluorescent tubes that all of us use in our homes. The current in the tube is sustained by plasma. The interactions produce high frequency radiation, mostly in ultra violet, which when falling over the fluorescent material of the walls of the tube produces visible light. At this point you might think that I am dodging you question “in what state of matter can we include fire”. Fire is not a thing but a happening. It is a happening in which high temperature does produce ionized particles that emit light during recombination. In that sense there is plasma in fire. But its flame and dance are due to turbulent convection in which air rushes in from out side, helps sustain the combustion in which energy is produced, rising gases include plasma and neutral gases. Fire would look rather different in a gravity free atmosphere. In short fire does contain some plasma along with other gases, besides the happening of a reaction in which energy is produced.